Yay for Spring friends! I have been loving the warmer weather so much, not to mention the new styles! I always love when the weather changes for two reasons. 1. It means that the climate is taking a turn (usually when I’m ready for a change) 2. It means new styles & new clothes! I love changing it up when it comes to clothing but especially accessories. I’ve said this before but I will say it again. Accessories are the easiest way to spice up your look and incorporate new trends! That’s where one of my all time favorite handbag companies comes into play, Brahmin! Brahmin has hands down the most divine handbags for every season and wonderful bags for every day looks! Check out my last post about there bags here. But I chose this Lane Lima in the Canvas color that I instantly fell in love with. I am obsessed with the vintage but chic air it has about it and feels that it screams spring! It can be worn in 2 different ways. Held by the hand handle or with the shoulder strap worn as a cross body. You know I’m a sucker for a good crossbody! Brahmin has some other amazing styles right now that I will link below. I linked my favorite round ones for this post but they have tons more on their site right here. The thing I love most about the Brahmin bags is how timeless they are. The styles are trendy but all so classic and could live on for ages! I love each leather they use and the textures they have. Also, the quality is unbeatable! These are the kind of bags that I have forever and pass down to Monroe. I also cannot tell you how many compliments I get each time I wear one of their bags! I’m constantly getting stopped and asked where I got it! Like I said earlier when it comes to change in season as much as I love the new styles of clothing I think the accessories are just as important and make even more of a statement than the clothes. 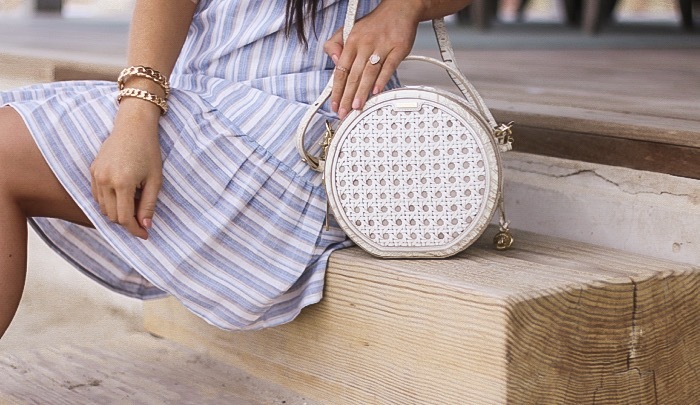 Some of my favorite ways to incorporate spring in my wardrobe are a good handbag just like this one from Brahmin, a cute bright dress, and fun shoes!